A German e-scooter manufacturer, Kumpan electric has been combining classic vehicle design with sustainable technology since 2010. A German e-scooter manufacturer, Kumpan electric has been combining classic vehicle design with sustainable technology since 2010. 2,500 Kumpan scooters are already traveling German roads. With the Companists' help, we now want to expand to other European countries and meet the increasing demand for emission-free mobility. We are pleased to provide you with our pitch deck, which summarizes Kumpan electric`s business model and strategy and illustrates our company’s potential. As always, you can find all information on us, our team, and Kumpan electric in our company profile. Please click on the picture above to open the pitch deck of Kumpan. Everything began in our parents' living room in 2009, when we three brothers – Daniel, Patrik, and Philipp – made the decision to replace existing gas scooters with emission-free, low-noise e-scooters. We thought the market for motorized bikes was a particularly exciting challenge because the reach requirements within this market are lower than those for other vehicles, such as cars. Bikes are an efficient means of transportation for short distances within large cities. The electric scooters available on the market back then were not technologically sophisticated enough, had a design that was unsuitable for the European market, or lacked the necessary quality and performance. Indeed, their reach was too low, their battery and charging management was unreliable, and their weight was too high. Moreover, importers and manufacturers lacked a professional brand identity – a gap we want to bridge though the Kumpan electric brand and our electric scooters. Based on the above facts, we started our highly exciting journey and began to focus on our vision of changing the streets of tomorrow. One year later, in 2010, the first Kumpan traveled the roads, and we were sitting in our first small office and working on the further development of the Kumpan e-scooters. In terms of design and quality, our first scooter model was a novelty on the European market. Until today, we have improved our product and expanded our team so much that our e-scooters now have the following distinguishing features: Easy charging through portable batteries and a reach of up to 150 km – a threefold increase since our first model (with a reach of 50 km). Users can charge the batteries at all conventional power outlets in their home. We have developed a product range consisting of three scooter models, all of which look similar to vehicles from the 50s and 60s. This retro design is a popular design for gas scooters, especially because it reminds people of the classic scooter, the Vespa. As retro design dominates the scooter market, we wanted to combine classic design with modern and green technology to create a novelty on the market. Consequently, we have adopted this approach for both brand development and product design. Customers appreciate our concept, so we have seen our company's revenues grow year after year. Together with our in-house engineering and design team, we have developed great products over the past six years, thus creating an attractive portfolio for one of the strong growth markets of the coming years. Our team enables us to keep improving our products and to strive for innovation leadership within the market. We strongly focus on the quality and design of our products, thus ensuring that the Kumpan vehicles remain exclusive products within the market. The three brothers who co-founded Kumpan form a strong team that helps the company progress. 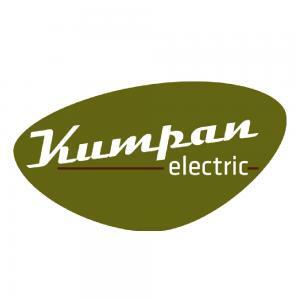 Because of their business education, they have the necessary expertise to make Kumpan electric successful at the international level and to further scale up the business model. We have carefully analyzed the changes in our customers' consumption and behavior patterns over the past six years and can now say that awareness of electric vehicles in particular has improved significantly over the past two years. In fact, customers are generally more open to electric vehicles and increasingly consider buying such a vehicle. Whereas only 27 percent of people surveyed could imagine buying an electric vehicle two years ago, this percentage has grown to 53 percent, as the authors of a study by Aral wrote. The German federal government's policy for supporting the expansion of electric mobility is a particularly important factor in boosting the growing electric mobility market and reaching the goal of bringing one million electric vehicles to German roads by 2020. As the German federal government introduced a subsidy for purchasers of electric cars but not for those of electric bikes in July 2016, we are offering such a subsidy ourselves. Indeed, since 1 August 2016, purchasers of a Kumpan electric scooter have been receiving a discount of EUR 500. Our goal is to convince even more people of two-wheeled electric mobility and to enable these people to participate in the successes of the Green Economy and of our company. In short, please support us during the exciting next growth stage of our e-scooter. e-bility GmbH (Kumpan electric) is a manufacturer of e-scooters. The product portfolio currently consists of three electric scooter models that resemble the popular vehicle design of the 50s and 60s. Our "1953" and "1954" models provide the foundation of our company's revenues. These models are both part of the 25 km/h and the 45 km/h segment and may be used with either a moped or a car license. The Kumpan electric – "1954" is the first Kumpan model and has now reached its fourth generation. We offer two versions of this model, one of them including a portable Kumpankraftpaket (a lithium-cobalt battery) and the other including a much cheaper but also heavier lead-gel battery. The Kumpan electric – "1953" is still in its first generation. This one-seat scooter has been available on the market since 2013. All of our models are available in four different colors. Customers can configure their own scooter on our website. They can choose the color of the paintwork and of the seat, the number of batteries, the tires, and the maximum speed and may add any accessories they want. Our online configurator enables our customers to create their favorite Kumpan online. Indeed, they can choose the model and the color of the paintwork, seat, and tires. Moreover, customers can select the maximum speed and battery capacity they want. The configurator serves as the foundation of our upcoming online store, where people will be able to directly order the vehicle they have created and the accessories we offer. Our "1950" kickboard is the latest addition to our product range, and it has been available on the market since early 2016. The "1950" model is an electric kickboard that distinguishes itself from existing products on the market through its motor, which supports users in a similar way as the motor of electric bicycles. The Street version of the kickboard enables users to control the speed through a throttle. The 1950 Street is one of the few kickboards approved for use on the road. The kickboard is easy to handle, lightweight, and foldable. If users take the subway, for instance, they can carry the kickboard using a shoulder strap, which enables them to easily get up and down stairs and to get through other areas where the kickboard cannot be used. They may also easily store the kickboard because it can be folded. Consequently, the kickboard may replace an entire bicycle because of its performance, size, and convenience. Our range of accessories consists of helmets, shoulder straps for batteries, brake disk locks, and many other helpful accessories for riders of our e-scooters. Through the Kumpan e-scooter, we offer a stylish vehicle that is also easy on the environment. In large cities with high traffic levels in particular, the e-scooter helps reduce fine-particle and noise pollution. According to a survey by GfK, purchasers of electric vehicles expect a sufficient reach, batteries that can be charged relatively fast and at home, and a low cost of use. The latest generation of Kumpan electric e-scooters meets these expectations. With a cost of use of only EUR 0.99 per 100 km, a reach of up to 150 km, and a battery that can be charged at any power outlet at home in less than four hours, we meet customers' demands. In addition, our e-kickboards are a reaction to the recent trend toward electric vehicles reaching up to 20 km/h. Our e-kickboard is based on a product established within the market, but it also uses innovative drive technology, that is, electrically assisted pushing. Through our e-scooters, we offer an inexpensive and emission-free alternative to scooters with gasoline-powered two-stroke and four-stroke engines, for instance for the growing online food-delivery industry. As their cost of use per 100 km is low (< 10 % than that of gas scooters) and they require little maintenance, our e-scooters are easy not just on the environment, but also on your personal budget. We noticed very early that we had to further expand our role as a manufacturer within the value chain in order to appropriately meet customer requirements in Europe. We succeeded in doing so by significantly increasing our activities in the supporting areas of the value chain (production planning and control, product development, procurement, and human resources). By hiring product designers, electrical engineers, and mechanical engineers, collaborating with German engineering companies, and intensifying our partnership with suppliers, we have managed to improve the design, construction, and technology of our products. We are aware of the higher level of responsibility that a manufacturer has compared to an importer (quasi-manufacturer). As only a manufacturer can successfully meet customers' needs over the long term, we decided early on to take the role of a vehicle manufacturer, thus gaining full control over the development and production process. To cover the risks of product liability, we have purchased an extended product liability insurance policy in addition to our quality management system. We have outsourced the logistics department to an external company, but we still coordinate the delivery (way and time) with this company. For the storage of our products, we have our own employees at our Remagen headquarters (in the German state of Rhineland-Palatinate). We distribute our Kumpan scooters primarily through bike retailers, through electronics retailers, and through our Remagen production facility. Moreover, we opened our first Kumpan store in Montreal (Canada) in 2015 to meet the increasing demand within the North American market. In terms of strategy, it was important to us to occupy a market that can serve as a springboard for North America and that will make it easier for us to access the most attractive market in North America, the U.S., afterward. Montreal, including its metropolitan area where roughly 4 million people live, offers sufficient potential for such a store. Moreover, after a target group analysis, we noticed that the people living in Montreal are open to innovation, are eco-friendly, and set trends for the whole of Canada. Just like in Germany, the Canadian season for scooter sales begins in March/April and ends in October/November. North America has a market potential of 50,000 e-scooters in 2018, which is expected to increase to 300,000 e-scooters in 2023 (Pike Research). Based on our current product and accessory portfolio, we can store approx. 1,000 scooters without having to rent any additional facilities. The scooters are transported to Remagen by water. Based on the FOB Incoterm rule, the transfer of risk takes place at our main supplier's facility when the goods are loaded onto the ship in port. To cover the risk of lost/damaged goods during import and delivery, we have purchased a cargo insurance policy. Transportation by water normally takes between four and six weeks. e-bility GmbH (Kumpan electric) is the first e-scooter manufacturer with a uniform concept ranging from the development and design of the products to their production and distinguishing Kumpan from its competitors (almost all of which are importers). Kumpan electric develops, designs, and assembles its vehicles itself. Moreover, we have created a brand supplemented by suitable accessories. We are one of the few companies on the market whose kickboard (our 1950 model) has been approved for use on the road. As most of our competitors' products have not been approved for this, we have a significant competitive edge. Our company's degree of innovation (digital speedometer, interconnected battery, boost button), our product quality, the sales price, the popular retro design, and the modern brand identity make Kumpan electric a compact and strong brand. Our portable battery system is the system with the highest reach on the market, enabling trips of up to 150 km. This is by far the highest reach within the e-scooter market. In addition, our portable battery 2.0 is a novelty within the e-scooter market. There has not been any other interconnected vehicle battery thus far. Moreover, we are the first company to offer cruise control and digital speedometers for e-scooters. We are currently working on a system for networking our e-scooters, which we will launch in 2017 and which will be ideal for scooter sharing and scooter rental companies. Using a sim card integrated into the battery, we can collect all data from sensors inside the battery in a cloud (external data storage) and make them available to fleet operators. Fleet operators may thus easily check the location of the scooter or battery, the battery level, the remaining capacity, the current tire pressure, etc., for scooter sharing is becoming available in more and more major cities where car sharing has been around for a while. We sell most of our Kumpan scooters through 250 retailers throughout Germany. These retailers are motorcycle and scooter dealers, car dealerships, bicycle dealers, or pure electric mobility dealers. While choosing our retailers, we pay particular attention to the existence of a showroom and a competent garage for service and maintenance. In addition to distribution via retailers, we distribute our products at our company headquarters, where we can directly interact with end customers and learn from their feedback. Finally, we sell our Kumpan products through Amazon, Media-Markt, and Conrad Electronic. Our customer base includes a total of 1,700 customers, 90 % of which are from Germany. When we started working on our battery 1.5, we also started our partnership with LG/Ansmann, a drive system and battery expert from the south of Germany. Furthermore, we are collaborating with Deutsche Telekom on our interconnected battery, the battery 2.0. Continental, which supplies the tires for one of our model series, is another renowned partner of ours. In terms of distribution, we cooperate with Conrad Electronic, Media-Market, and Amazon. Our core target group consists of people aged between 30 and 50 from the LOHAS (lifestyle of health and sustainability) demographic. This group of people is pragmatic, pays attention to health and the environment, and bases its life on the principles of sustainability. In addition, these people have an above-average income. Finally, our target group consists of equal numbers of women and men. Unlike typical customers in the motorized bike sector, our customers focus particularly on sustainable and green technology. According to a public opinion poll by Creditreform from 2016, most Germans (57 %) can imagine using an electric vehicle to protect the environment Because of the increased acceptance of electric mobility and an increased willingness to buy an electric vehicle, studies expect growth rates in the e-scooter and motorcycle market to increase. In 2020, 150 million motorized bikes will be sold worldwide, and the market will outpace the global market for cars in terms of units sold. If one looks solely at the European market, the number of motorized bikes sold in 2014 was 1.2 million. In 2013, the number of e-scooters sold in China had already reached 9.4 million. Cities such as Munich, Genoa, and Tübingen are already subsidizing e-scooter purchases and the elimination of gas scooters. If one considers the success story of the e-bike, the precursor of the e-scooter, one notices that the number of e-bike registrations has increased from 8,000 in 2001 to 535,000 today (in 2015). In other words, the e-bike market is now 67 times as large as it was 14 years ago. Our goal is to bring our "German proof of concept" to the rest of the world. We will first focus on Germany's neighboring countries in Europe, which offer a market potential of 1.2 million motorized bikes. We plan to roll out our distribution concept particularly in countries where bikes are even more relevant than in Germany, for instance in France, Italy, Belgium, and the Netherlands. We have developed an attractive product portfolio with a large distribution and service network throughout Germany. Now we want to internationally expand this network. For this purpose, we will launch our battery 2.0 (interconnected battery) on the market in 2017, increase our overall marketing activities, and develop a global online store of our own. We plan to continuously increase our investment in online marketing (SEO & SEA) to increase the visibility of our online store and to generate significant revenues through this store. People will then be able to order our Kumpan scooters from anywhere in the world. Moreover, we will boost direct sales in 2017 through two stores of our own in Europe. We will also continue to expand our B2B segment in the sharing and delivery service markets, which will help us benefit from the scooter sharing trend in the next few years. The sharing market is so interesting to us because scooter sharing operators always order large quantities of scooters for the cities in which they do business, that is, 150-500 scooters per city. Second, the Kumpan electric brand will benefit from the increased presence of our scooters in cities due to scooter sharing. Indeed, each scooter from a sharing operator's fleet also advertises our brand. Thanks to the features of our battery 2.0, we can offer fleet operators a solution that provides them with additional data and cuts costs by making other hardware components unnecessary. Thanks to our delivery vehicles, all restaurants with a delivery service become our potential customers. We will use the capital raised through equity-based crowdfunding to scale up our business model. In case we raise EUR 1,000,000, we will invest in our final assembly facility in Remagen in order to assemble our scooters even faster and more efficiently, and we will hire additional personnel to prepare for our company's growth. In that case, we will hire additional personnel in the areas of product development (2), sales & marketing (2), internal sales (2), and production (2) in particular. If we reach the EUR 1,500,000 mark, we plan to open another Kumpan store and to expand our product range. In fact, we want to add faster vehicles to our product range to also meet the demand for faster scooters (80-120 km/h). Finally, we plan to invest the remaining funds in the internationalization of Kumpan. Tell the world that e-scooters exist and that the Kumpan scooters are true companions! We would like to benefit from your opinion. If, for example, we are conducting surveys, we would like to get your suggestions and opinions and to take the related measures. Ride our Kumpan scooters and raise awareness of our brand. Feel free to visit us, and we will show you the world of Kumpan in Remagen.